HSV type 1 (HSV-1)–specific CD8+ T cells provide immunosurveillance of trigeminal ganglion (TG) neurons that harbor latent HSV-1. In C57BL/6 mice, the TG-resident CD8+ T cells are HSV specific and maintain a 1:1 ratio of cells recognizing an immunodominant epitope on viral glycoprotein B (gB498–505-Tet+) and cells reactive to subdominant epitopes (gB-Tet−). The gB-Tet− CD8+ T cells maintain their frequency in TG by balancing a higher rate of proliferation with a correspondingly higher rate of apoptosis. The increased apoptosis is associated with higher expression of programmed death-1 (PD-1) on gB-Tet− CD8+ T cells and the interaction with PD-1 ligand (PD-L1/B7-H1). IFN-γ regulated expression of the PD-1 ligand (PD-L1/B7-H1) on neurons bearing higher copies of latent viral genome. In latently infected TG of B7-H1−/− mice, the number and frequency of PD-1+ gB-Tet− CD8+ T cells increases dramatically, but gB-Tet− CD8+ T cells remain largely nonfunctional and do not provide increased protection from HSV-1 reactivation in ex vivo cultures of latently infected TG. Unlike observations in some chronic infection models, B7-H1 blockade did not increase the function of exhausted gB-Tet− CD8 T cells in latently infected TG. Persistent exposure to cognate Ag during chronic viral infections can lead to CD8+ T cell functional exhaustion (1–3), which is associated with expression of several inhibitory receptors including the programmed death-1 (PD-1) receptor (4–9). CD8+ T cells transiently express PD-1 during initial antigenic exposure (10, 11), but constitutively express the receptor when they become exhausted (4, 5, 8). CD8+ T cell exhaustion ranges in severity from functional impairment to deletion, and the latter stages are associated with elevated PD-1 expression. There are two known ligands for PD-1: PD-ligand 2 (PD-L2) is expressed primarily on APCs such as dendritic cells, whereas PD-L1 (B7-H1) is inducible on a variety of cell types (12). Herpesviruses including HSV type 1 (HSV-1) cause latent infections that lie somewhere between the extremes of acute and chronic infections. During HSV-1 latent infections, the viral genome is primarily restricted to neurons of the sensory ganglia (trigeminal ganglion [TG] postinfection of the oral facial region), where viral genes are largely transcriptionally repressed. The concept of a silent HSV-1 latent infection where HSV-1 can avoid immune elimination by hiding from the host immune system during latency has been challenged by molecular and immunologic studies suggesting low-level expression of viral transcripts and localization of activated CD8+ T cells to latently infected neurons (13–19). The CD8+ T cells in latently infected mouse and human TG persistently express an activation phenotype, and mouse CD8+ T cells form apparent immunologic synapses with latently infected neurons (15, 16), suggesting persistent or intermittent exposure to low levels of viral Ags that are expressed in latently infected neurons. Whether persistent, low-level antigenic exposure during latent viral infections leads to CD8+ T cell exhaustion remains controversial. A previous report by Allen et al. (20) suggested that the HSV-1 latency-associated transcripts regulate exhaustion of TG-resident CD8+ T cells specific for an immunodominant epitope on HSV-1 glycoprotein B (gB498–505). However, the authors provided no direct evidence that the gB498–505–specific CD8+ T cells were functionally compromised. Moreover, several other studies demonstrated that the gB498–505–specific cells retain full functionality during latency, even when latency is interrupted by serial reactivation events (21, 22). Indeed, in examining the expression of the inhibitory receptor PD-1 that is associated with exhausted CD8+ T cells, Allen et al. (20) showed a very low frequency (7%) of PD-1+ TG-resident immunodominant CD8+ T cells, and much higher expression on those that were not specific for the immunodominant epitope. It now appears that all CD8+ T cells in acutely and latently infected TG are HSV specific, recognizing the immunodominant gB498–505 epitope and 18 subdominant epitopes on 11 HSV-1 proteins (23). Thus, these findings appear to be more consistent with the notion that it is the HSV-specific CD8+ T cells specific for subdominant epitopes that become preferentially exhausted in latently infected TG. This notion was confirmed in a recent study demonstrating that immunodominant gB498–505–specific CD8+ T cells retain full functionality in latently infected TG, whereas the HSV-specific subdominant CD8+ T cells exhibit significantly reduced functionality (A.J. St. Leger, S. Jeon, and R.L. Hendricks, submitted for publication). Moreover, IL-10 was shown to selectively regulate the proliferation of the HSV-specific subdominant CD8+ T cells in latently infected TG leading to more functional cells, which is consistent with a state of partial exhaustion of these cells during latency. In this study, we confirm that most PD-1 expression is on TG-resident CD8+ T cells that do not recognize the immunodominant epitope, and further demonstrate that: 1) increased PD-1 expression is associated with reduced functionality; 2) the PD-1 ligand (PD-L1/B7-H1) is induced on neurons by IFN-γ in latently infected TG; 3) blocking PD-1/B7-H1 interaction increases survival of gB-Tet- CD8+ T cells in latently infected TG, leading to a dramatic increase in their numbers; but 4) the surviving cells are not functional and do not provide increased protection from HSV-1 reactivation from latency in ex vivo TG cultures. Wild-type (WT) HSV-1 strain RE was grown in Vero cells, and intact virions were isolated on Optiprep gradients according to the manufacturer’s instructions (Accurate Chemical and Scientific, Westbury, NY). Mice were anesthetized by i.p. injection of 2.5 mg ketamine hydrochloride and 0.25 mg xylazine (Phoenix Scientific, San Marcos, CA) in 0.25 ml HBSS (BioWhittaker, Walkersville, MD). Mice received bilateral topical infection on scarified corneas with a dose of 1 × 105 PFU HSV-1. Female WT C57BL/6 mice and IFN-γR−/− (B6.129S7-Ifngr1tm1Agt/J) mice, 6–8 wk old, were purchased from The Jackson Laboratory (Bar Harbor, ME). B7-H1−/− mice were provided by Dr. Lieping Chen (Yale University School of Medicine, New Haven, CT). All experimental animal procedures were reviewed and approved by the University of Pittsburgh Institutional Animal Care and Use Committee, and the animals were handled in accordance with guidelines established by Institutional Animal Care and Use Committee. Bone marrow chimeras were created by tail vein transfer of 1 × 106 bone marrow cells from 6-wk-old WT C57BL/6 mice into 6-wk-old lethally irradiated (2 × 500 rad treatments separated by 4 h rest) WT C57BL/6 recipients (WT→WT), IFN-γR−/− recipients (WT→IFN-γR−/−), or B7-H1−/− recipients (WT→ B7-H1−/−). The resulting mice were housed under immunocompromised mouse conditions for 8 wk after the transfer, and neomycin sulfate (2 mg/ml) from Sigma-Aldrich (St. Louis, MO) was put in their drinking water for 2 wk after the transfer. Bone marrow chimeras were fully reconstituted after 8 wk. PE-conjugated H-2Kb tetramers conjugated to the gB498–505, ribonucleotide reductase 1 982–989 (RR1982–989), or RR1822–829 peptides were provided by the National Institute of Allergy and Infectious Diseases Tetramer Core Facility (Emory University Vaccine Center, Atlanta, GA). IFN-γ neutralizing Ab (XMG1.2) for in vivo neutralizations was purchased from BioXcell. Rat anti-mouse Pacific blue–conjugated anti-CD8α (clone 53-6.7), allophycocyanin-conjugated anti–IFN-γ (clone XMG1.2), PerCP-conjugated anti-CD45 (clone 30-F11), and allophycocyanin-conjugated anti–granzyme B (anti-GrzB; clone GB11) were purchased from BD Pharmingen. PE-conjugated anti–PD-L1 (clone MIH5) and allophycocyanin-eFluor780–conjugated anti-Thy1.2 (clone 53-2.1) were purchased from eBioscience. An FITC-conjugated Ab specific for the neuronal nucleus marker (NeuN; clone A60) was purchased from Millipore (Billerica, MA). The PE-Cy7–conjugated anti–PD-1 (clone RMP1-30) was purchased from BioLegend (San Diego, CA). Appropriate isotype control Abs were purchased from BD Pharmingen, eBioscience, or BioLegend. For intracellular staining, Cytofix/Cytoperm and Permeabilization Buffer from BD Biosciences were used. All flow cytometry samples were collected on a FACSAria cytometer and analyzed by FACSDiva software (BD Biosciences). GraphPad Prism software (La Jolla, CA) was used for all statistics. For PE-conjugated gB498–505, RR1982–989, or RR1822–829 tetramer staining, negative controls (without PE-conjugated tetramer stain) were used to gate tetramer+ cell populations. For all surface and intracellular staining, appropriate isotype control Abs were used to gate positive populations by FACSDiva software (BD Biosciences). Anesthetized mice were injected with 0.3 ml heparin (1000 U/ml) and euthanized by exsanguination. Excised TG were digested in 100 μl per TG of DMEM (BioWhittaker) containing 10% FCS and 400 U/ml collagenase type I (Sigma-Aldrich) for 1 h at 37°C, and dispersed into single-cell suspensions by trituration through a p-200 pipette tip. Pooled TGs were harvested from HSV-1 latently infected C57BL/6 mice at 32 d post–corneal infection (dpi) and dispersed into single-cell suspensions as described earlier. TG cells were stained for surface markers (CD45, Thy1.2, and PD-L1) for 1 h at 4°C, fixed and permeabilized using Cytofix/Cytoperm from BD Biosciences, and intracellularly stained for NeuN. The neurons (CD45−, Thy1.2+, NeuN+) were sorted into >95% pure PD-L1+ and PD-L1− subpopulations using a FACSAria cytometer. Sorted cells were then used for quantification of HSV-1 glycoprotein H (gH) DNA copies as described earlier. The number of copies of HSV-1 genome in latently infected TG was determined by real-time PCR quantification of the HSV-1 gH gene in DNA extracts of individual TG or neuronal subpopulations as previously described (24). In brief, DNA was extracted from dispersed TG cells using DNeasy columns (Qiagen) according to manufacturers’ instructions and quantified spectrophotometrically. The DNA was mixed with TaqMan Universal PCR Master Mix (Roche, Branburg, NJ) and an HSV-1 gH-specific primer-probe set, custom-designed and synthesized by ABI Assays-by-Design service (Applied Biosystems, Foster City, CA). Samples, standards, and controls were assayed in 96-well plates with an ABI Prism 7700 sequence detector. ABI Primer Express v1.5a software default settings were used for instrument control and data analysis. The gH sequences were: forward primer (5′-GACCACCAGAAAACCCTCTTT-3′), reverse primer (5′-ACGCTCTCGTCTAGATCAAAGC-3′), and probe (5′-[FAM]TCCGGACCATTTTC[NFQ]-3′). The number of copies of gH DNA in each sample was determined from a standard curve generated using known concentrations of gH-containing plasmid standards, and the number of copies of viral gH DNA/TG was calculated based on the total DNA extracted from each TG. Latently infected mice received two daily i.p. injections of BrdU (1 mg/mouse) to measure CD8+ T cell proliferation. TG were excised 24 h after the second BrdU injection, and dispersed cells were stained with anti-CD45, anti-CD8α, and tetramers for 1 h at room temperature. CD8+ T cells that divided over the 2-d period were quantified by flow cytometry using a BrdU proliferation assay kit (catalog no. 559619; BD Pharmingen) according to manufacturers’ instructions. A CaspaTag assay kit (catalog no. APT420; Chemicon International) was used according to manufacturer’s instructions to quantify CD8+ T cells undergoing apoptosis. B6WT3 fibroblast targets were infected with HSV-1 (10 PFU/cell for 6 h) or pulsed with peptides (gB498–505, RR1982–989, or RR1822–829) at a concentration of 0.8 μg/ml for 45 min at 37°C/5% CO2. Cells from each TG were stimulated with 5 × 105 HSV-1–infected or peptide-pulsed fibroblasts in the presence of RPMI/10% FCS, and Golgi-Plug (BD Biosciences) for 6 h at 37°C/5% CO2. In some experiments, TG cells were pretreated with PE-conjugated gB(498–505) tetramers (2 μg/ml) for 30 min at 37°C/5% CO2 before stimulation with HSV-1–infected B6WT3 cells. After stimulation, cells were surface stained for CD8α, permeabilized and fixed with Cytofix/Cytoperm (BD Biosciences), and stained for intracellular IFN-γ and TNF-α. HSV-1 latently infected TG cells were dispersed and cultured in 48-well tissue culture plates (0.2 TG/well) in culture medium (DMEM containing 10% FCS, 500 U/ml rIL-2 [R&D Systems, Minneapolis, MN]) and 50 μm 2-ME (Fisher Scientific, Fair Lawn, NJ) with or without anti-CD8α Ab (100 μg/ml)) for up to 10 d. Supernatants were serially sampled and replaced with a similar volume of culture medium, and samples were assayed for the presence of infectious virus on Vero cell monolayers as previously described (25). HSV-specific CD8+ T cells consistently maintain a 1:1 ratio of cells specific for an immunodominant gB498–505 epitope (here referred to as gB-Tet+ CD8) to those recognizing subdominant epitopes (here collectively referred to as gB-Tet− CD8; Fig. 1A) (26), despite the fact that the latter population exhibits a significantly higher rate of cell division than gB-Tet+ CD8+ T cells in latently infected TG (Fig. 1B). The rate of proliferation varied among TG resident CD8+ T cells specific for individual subdominant epitopes, but all those analyzed except the RR1982-specific cells showed a significantly higher rate of proliferation than the gB-Tet+ CD8+ T cells. The gB-Tet− CD8+ T cells also exhibited a significantly higher rate of apoptosis than that seen in the gB-Tet+ CD8 population (Fig. 1C). Thus, the increased rate of cell division appears to be balanced by a corresponding increase in the rate of apoptosis among gB-Tet− CD8+ T cells, maintaining the 1:1 ratio of immunodominant to gB-Tet− CD8+ T cells. Also, a significantly lower percentage of gB-Tet− CD8+ T cells showed GrzB expression, which had an inverse correlation with PD-1 expression (Fig. 1D), suggesting selective functional impairment in the PD-1+ cells. Furthermore, these PD-1+ gB-Tet− CD8 T cells seemed to be an effector cell population experiencing exhaustion, as suggested by their lack of CD127 expression. Differences between immunodominant gB(498–505)–specific CD8+ T cells and subdominant epitope-specific CD8+ T cells. Mice latently infected with HSV-1 (30 dpi) received two i.p. BrdU treatments (1 mg/mouse) over a 2-d period and then trigeminal ganglia were excised and dispersed into single-cell suspensions. Cells were stained with H-2Kb tetramers containing the immunodominant gB498–505 epitope (gB; A–F), or subdominant epitopes on HSV-1 RR1 (RR1982–989, RR1822–829) and infected cell protein 8 (ICP8171–179, ICP8876–883) (B, E, F), with fluorescently tagged Abs to CD45, CD8, PD-1, CD127 (D–F), and BrdU (B) or GrzB (D), or with a fluorescently labeled pan caspase inhibitor (CaspaTag) to identify apoptotic cells (C) and analyzed on a FACSAria using FACSDiva software. (A) Bars represent the mean percentage of gB tetramer positive (gB-Tet+) and negative (gB-Tet−) CD8+ T cells/TG ± SEM (n = 10 mice). (B) Bars represent the mean percentage of BrdU+ cells in HSV-1 epitope-specific CD8+ T cell populations ± SEM (n = 5 mice/group). (C) Comparison of apoptosis within gB-Tet+ CD8 and gB-Tet− CD8+ cells (n = 5 mice). (D) Representative dot plots showing gB tetramer and GrzB staining (far left and left), GrzB and PD-1 staining (right), and CD127 and PD-1 staining (far right; n = 5 mice). (E) Representative dot plots and a bar graph showing the mean percentage ± SEM of PD-1+ cells in HSV-1 epitope-specific CD8+ T cell populations (n = 5 mice). (F) Mean PD-1 MFI for each HSV-1 epitope-specific CD8+ T cells (n = 5 mice). All data are from at least two independent experiments. *p ≤ 0.05, **p ≤ 0.01, ***p ≤ 0.001. The increased proliferation and decreased survival and function of TG-resident gB-Tet− CD8+ T cells suggested a state of partial exhaustion among these cells. Because CD8+ T cell functional exhaustion and deletion are associated with increased expression of PD-1, we hypothesized a higher level of PD-1 expression on gB-Tet− CD8 T cells relative to their gB-Tet+ CD8 counterparts in latently infected TG. Indeed, gB-Tet− CD8+ T cells exhibited a higher frequency of PD-1+ cells and a higher level of PD-1 expression/cell relative to their immunodominant gB-Tet+ CD8 counterparts in latently infected TG (Fig. 1E, 1F). Because CD8+ T cells interact closely with neurons in infected TG (15, 16), we asked whether TG neurons constitutively express the PD-1 ligand, PD-L1/B7-H1, or are induced to express the ligand post HSV-1 infection. The frequency of PD-L1/B7-H1+ neurons was very low (<5%) in noninfected TG but increased significantly postinfection, reaching expression on nearly 70% of neurons by 7 dpi (Fig. 2A–C). The frequency of PD-L1/B7-H1+ neurons decreased from acute (8 dpi) to latent (>30 dpi) infection, but remained significantly higher than that observed in noninfected TG (Fig. 2C, 2D). PD-L1/B7-H1 expression on neurons in the trigeminal ganglia post HSV-1 infection. HSV-1–infected TG were excised at various times postinfection and dispersed neurons were stained with Abs against CD45, Thy1.2, PD-L1, and intracellular NeuN. (A and B) Representative dot plots showing gating strategies for quantification of PD-L1+ neurons at 8 dpi. (C) Bars represent the mean percentage ± SEM of PD-L1+ cells within the CD45− Thy1.2+ NeuN+ neuron population (n = 5 mice/time). (D) Representative graph shows the average ± SEM number of CD8+ T cells or PD-L1+ neurons in the TG at various times postinfection (n = 3–7 mice/time). Three independent experiments produced similar results. It was unclear whether PD-L1/B7-H1 expression was directly or indirectly regulated by HSV-1 infection. The latter possibility was suggested by the fact that more neurons expressed PD-L1/B7-H1 at 7 dpi than would be expected to be HSV-1 infected (Fig. 2C), and by the close association between CD8+ T cell infiltration and neuronal PD-L1/B7-H1 expression in the TG (Fig. 2D). Because TG-resident CD8+ T cells produce IFN-γ when stimulated by HSV Ags (26) and PD-L1/B7-H1 expression on oligodendroglia is selectively upregulated by IFN-γ (27), we hypothesized that PD-L1/B7-H1 expression on neurons is indirectly regulated by IFN-γ in infected TG. Indeed, we found that PD-L1/B7-H1 expression on TG neurons at 8 dpi was significantly, but not completely reduced when mice were treated with IFN-γ neutralizing Ab at 4 and 6 dpi (Fig. 3A). To investigate the role of IFN-γ in regulating neuronal PD-L1/B7-H1 expression in a cleaner system, bone marrow chimeras were created by transferring WT bone marrow into irradiated WT or IFN-γR knockout (IFN-γR−/−) mice. The WT recipients of WT bone marrow showed the expected upregulation of PD-L1/B7-H1 expression on TG neurons at 8 and 32 dpi (Fig. 3B). In contrast, the IFN-γR−/− recipients of WT bone marrow that were incapable of expressing IFN-γR on neurons showed no upregulation of neuronal PD-L1/B7-H1 expression. The IFN-γR+ and IFN-γR− neurons had similar viral loads at 8 and 32 dpi (data not shown), demonstrating that neuronal PD-L1/B7-H1 expression in HSV-1–infected TG is regulated by IFN-γ and not directly by the virus. 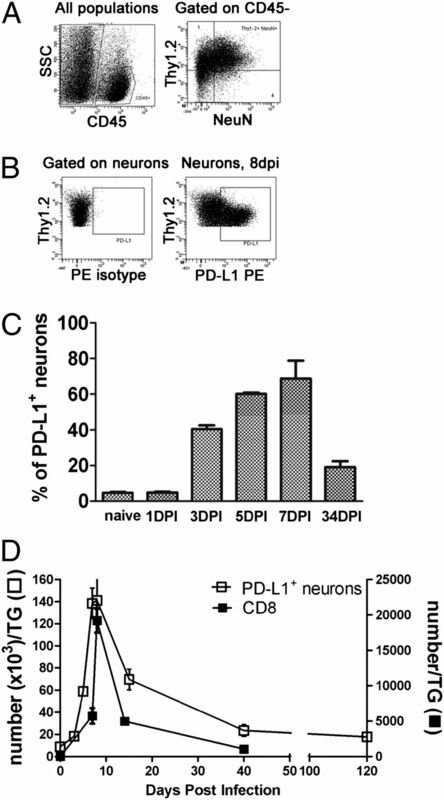 IFN-γ regulates PD-L1 expression on TG neurons. (A) Mice received i.p. injections (1 mg/mouse) of either anti–IFN-γ or control Ab at 4 and 6 dpi, TG were excised at 7 dpi, and dispersed cells were stained for PD-L1/B7-H1, CD45, Thy1.2, and NeuN. Bar graph shows the mean ± SEM percentage of PD-L1/B7-H1+ PD-L1+ CD45− Thy1.2+ NeuN+ neurons. (B) TG were obtained from noninfected (naive) mice or from bone marrow chimeric mice that expressed IFN-γR on all cells (WT to WT) or only on bone marrow–derived cells (WT to IFN-γR−/−), and dispersed TG were stained as in (A) and analyzed by flow cytometry. The bar graph shows the mean ± SEM percentage of PD-L1/B7-H1+ neurons. Data are representative of two independent experiments (n = 5 mice [10 TG]/group/experiment). *p ≤ 0.05, **p ≤ 0.01, ***p ≤ 0.001. Based on the assumption that latently infected TG neurons would be more likely to be exposed to IFN-γ, we proposed that PD-L1/B7-H1+ neurons would contain a higher load of latent virus than their noninfected counterparts. In fact, when latently infected TG neurons were FACS sorted into PD-L1+ and PD-L1− subpopulations, the PD-L1+ neurons were found to contain more copies of latent HSV-1 genomes per 100 cells than the PD-L1− population (Fig. 4). However, two points merit mention. First, PD-L1+ neurons contained only 30 copies of viral genome per 100 cells. Assuming 1 copy of viral genome/infected neuron (quite possibly an underestimate), our data suggest a maximum of 30% of PD-L1+ neurons harbor latent virus. Second, because PD-L1+ neurons represent ∼30% of total TG neurons during latency, the distribution of total latent virus is approximately equivalent in PD-L1+ and PD-L1− neurons. Elevated HSV-1 genome copy number in PD-L1+ neurons. Both TG were excised from three mice at 32 dpi, pooled, and dispersed cells stained for CD45, Thy1.2, PD-L1, and intracellular NeuN. The neurons (CD45−, Thy1.2+, NeuN+) were sorted into >95% pure PD-L1+ and PD-L1− subpopulations using a FACSAria cytometer. DNA extracts from sorted cells were then analyzed for viral genome copy number by quantitative PCR. Bars represent the mean ± SEM copies of HSV-1 genome/100 cells. Data are pooled from three independent experiments with six pooled TG/experiment. *p ≤ 0.05. Because gB-Tet− CD8+ T cells in latently infected TG express more PD-1 and undergo apoptosis at a higher rate, we asked whether PD-1 interaction with PD-L1/B7-H1 regulates the frequency of gB-Tet− CD8+ T cells within latently infected TG. As demonstrated earlier, latently infected TG of WT mice contain equivalent numbers of immunodominant gB-Tet+ CD8 and gB-Tet− CD8+ T cells (Fig. 5A). However, latently infected TG of mice that are genetically deficient in B7-H1 (B7-H1−/− mice) exhibit a significantly increased number of gB-Tet− CD8 and a slight, but significant reduction in gB-Tet+ CD8 (Fig. 5A). This results in a significant increase in the frequency of gB-Tet− cells (Fig. 5B). The immunodominant gB-Tet+ CD8 population consistently comprised ∼50% of the TG resident CD8+ T cell population in infected TG of WT mice from acute infection through latency (Fig. 5C). In contrast, the immunodominant gB-Tet+ CD8 population represented a slightly reduced proportion of the TG-resident CD8+ T cells in acutely infected TG (8 dpi) and progressively declined during latency (Fig. 5C). Interestingly, during latency, 80% of the TG-resident gB-Tet− CD8 expressed PD-1 in B7-H1−/− mice compared with <20% in WT mice (Fig. 5D), and the level of PD-1 expression (mean fluorescence index [MFI]) was also significantly higher (Fig. 5E). In contrast, the frequency and level of expression of PD-1+ on immunodominant gB-Tet+ CD8 was only slightly increased in B7-H1−/− mice. 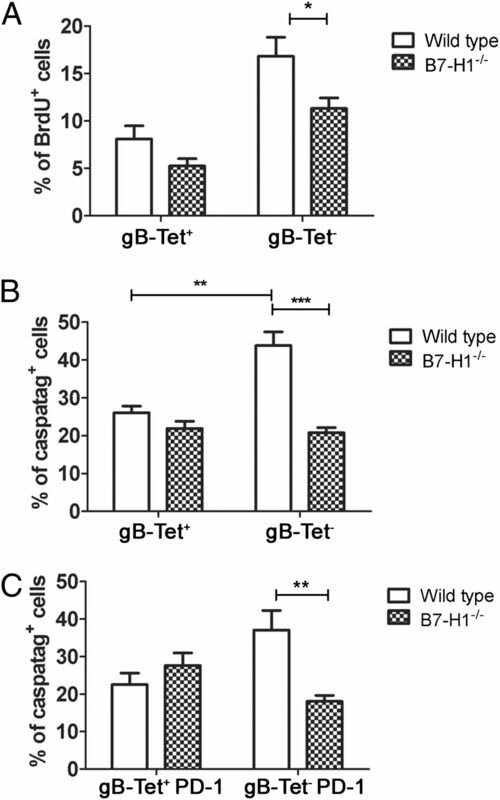 Significantly increased number of PD-1hi gB-Tet− CD8+ T cells in B7-H1−/− TG. TG from WT or B7-H1−/− C57BL/6 mice were obtained at 30 dpi (A, B, D, E) or at indicated times postinfection (C), and dispersed cells were stained for CD45, CD8, gB(498–505)–tetramer (gB-Tet), and PD-1, and analyzed by flow cytometry. (A) Bars represent the mean ± SEM number of gB-Tet+ and gB-Tet− CD8+ T cells in TG of WT and B7-H1−/− mice (n = 10 mice). (B) Bars represent the mean ± SEM percentage of gB-Tet− CD8+ T cells (n = 10 mice). (C) Line graph showing the mean ± SEM percentage of gB-Tet+ CD8+ T cells at indicated time points in TG of WT and B7-H1−/− mice (n = 5 mice). (D) Representative dot plots showing PD-1 staining on gB-Tet+ and gB-Tet− CD8+ T cells in TG of WT and B7-H1−/− mice. Bars indicate the mean ± SEM percentage of PD-1+ gB-Tet+ and gB-Tet− CD8 T cells from WT and B7-H1−/− mice (n = 10 mice). 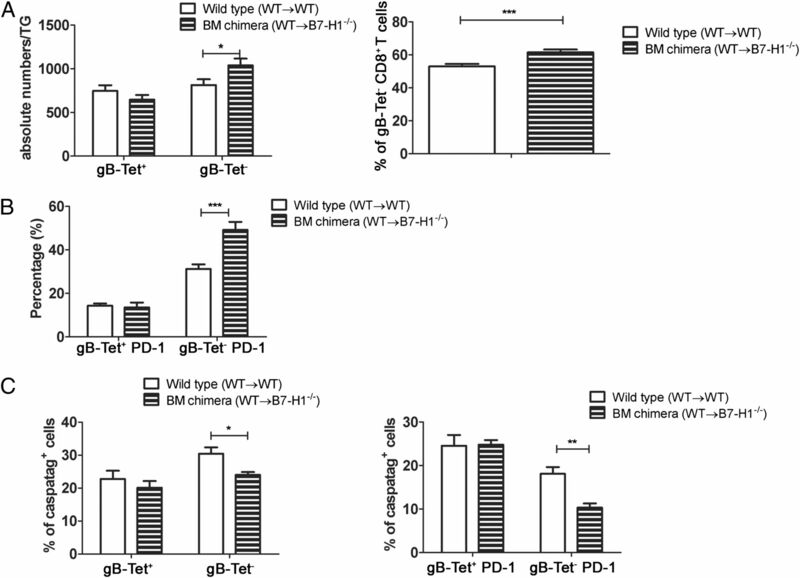 (E) Bar graph showing PD-1 MFI for the gB-Tet+ and gB-Tet− CD8+ T cells in WT and B7-H1−/− TG (n = 10 mice). All data are pooled from three independent experiments. *p ≤ 0.05, ***p ≤ 0.001. The increased number and frequency of gB-Tet− CD8+ T cells in the latently infected TG of B7-H1−/− mice could be because of a selective increase in proliferation and/or survival of the gB-Tet− CD8 relative to the gB-Tet+ CD8+ T cells. We found that the rate of cell division (BrdU incorporation) among gB-Tet− CD8 was slightly reduced in B7-H1−/− mice (Fig. 6A), but their reduced rate of proliferation was overcompensated by a 51% reduction in their rate of apoptosis based on CaspaTag staining (Fig. 6B, 6C). In contrast, neither the rate of proliferation nor the rate of apoptosis of gB-Tet+ CD8 was significantly affected in B7-H1−/− mice. In latently infected TG, PD-L1/B7-H1 is expressed on CD45+ bone marrow–derived cells, as well as on neurons (data not shown), and the relative contribution of expression on these two cell types to the survival of the gB-Tet− CD8+ T cells is unclear. Therefore, mice capable of expressing B7-H1 on bone marrow–derived cells, but not on neurons, were created by transferring WT bone marrow into irradiated B7-H1−/− recipients. These mice showed a selective increase in TG-resident gB-Tet− CD8+ T cells relative to controls (Fig. 7A), although the increase was much less dramatic than that seen in B7-H1−/− mice (Fig. 5A, 5B). The selective lack of B7-H1 on neurons also resulted in an increased frequency of PD-1+ gB-Tet− CD8+ T cells in latently infected TG (Fig. 7B), although again the difference was not as dramatic as that seen in the B7-H1−/− mice (Fig. 5D). The increased size of the gB-Tet− CD8+ T cell population in ganglia of chimeras lacking B7-H1 only on neurons was associated with a decreased rate of apoptosis (Fig. 7C). Thus, B7-H1 expression on nonhematopoietic cells is at least partially responsible for the selective accumulation of gB-Tet− CD8 in latently infected TG of B7-H1−/− mice. 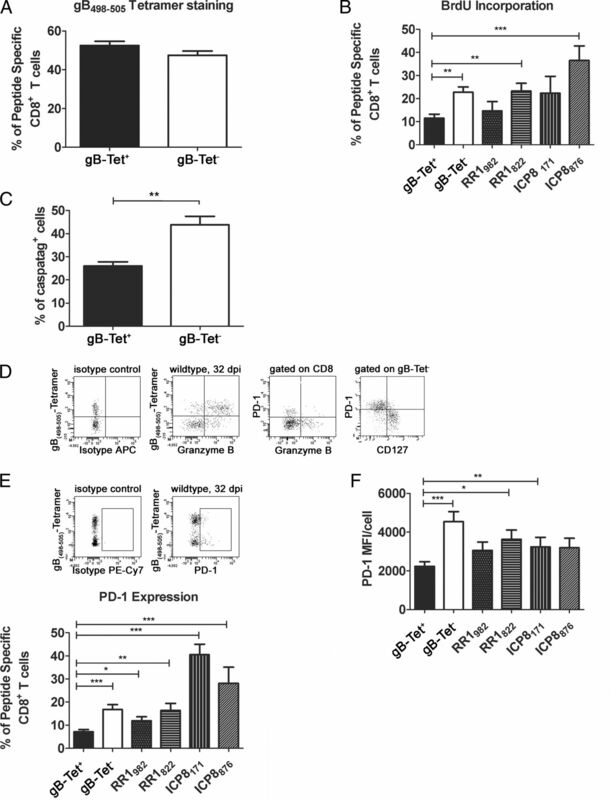 PD-1/B7-H1 regulates survival of gB-Tet− CD8+ T cells. At 30 dpi, WT and B7-H1−/− mice received two daily i.p. injections of BrdU (1 mg/mouse). At 32 dpi, TG were excised and dispersed cells stained for CD45, CD8, gB(498–505)–specific tetramer (gB-Tet), and PD-1 and for BrdU (A) or CaspaTag (B, C). (A) Bars represent the mean percentage ± SEM of BrdU+ cells in gB-Tet+ and gB-Tet− CD8 T cells from WT and B7-H1−/− mice (n = 5 mice). (B and C) Bars represent the mean percentage ± SEM of CaspaTag+ cells within the indicated cell populations (n = 5 mice). Data are representative of two independent experiments. *p ≤ 0.05, **p ≤ 0.01, ***p ≤ 0.001. B7-H1 on neurons is partially responsible for controlling the survival of PD-1+ gB-Tet− CD8+ T cells. TG were obtained at 30 dpi from bone marrow chimeric mice that were capable of expressing B7-H1 on all cells (WT to WT) or only on bone marrow–derived cells (WT to B7-H1−/−). Dispersed cells were stained for PD-1 and with gB498–505–tetramers (gB-Tet) and analyzed by flow cytometry. (A) Bars represent mean ± SEM absolute numbers (left panel) or percentage (right panel) gB-Tet+ and gB-Tet− CD8+ T cells. (B) Bars represent the mean ± SEM percentage of PD-1+ gB-Tet+ and gB-Tet− CD8+ T cells. (C) Bars represent the mean ± SEM of CaspaTag+ gB-Tet+ and gB-Tet− CD8+ T cells (left panel) and the percentage of CaspaTag+ PD-1+ gB-Tet+ and gB-Tet− CD8+ T cells (right panel). All data are representative of two independent experiments. Bars represent mean ± SEM (n = 5 mice). *p ≤ 0.05, **p ≤ 0.01, ***p ≤ 0.001. Dispersed TG cells from latently infected WT or B7-H1−/− mice were stained directly ex vivo with tetramers containing the immunodominant gB498–505 epitope, stimulated with HSV-1–infected B6WT3 cells for 6 h, and then stained for intracellular IFN-γ. Flow cytometry analysis of CD8+ T cells from TG of WT mice showed that IFN-γ was produced by 80% of the immunodominant gB-Tet+ CD8, but only ∼30% of the gB-Tet− CD8 after stimulation (Fig. 8A). This is consistent with our previous observation that in WT mice, gB-Tet+ CD8 retain functionality, whereas the gB-Tet− cells become partially exhausted (A.J. St. Leger et al., submitted for publication). In latently infected TG from B7-H1−/− mice, the frequency of gB-Tet+ CD8 is reduced to ∼10% of the total CD8+ T cells primarily due to a dramatic increase in the gB-Tet− cells (Fig. 5A, 5B). The overall frequency of IFN-γ–producing CD8+ T cells in TG of B7-H1−/− mice was reduced to ∼12%, with ∼80% of gB-Tet+ CD8 responding, but <3% of gB-Tet− CD8 responding. 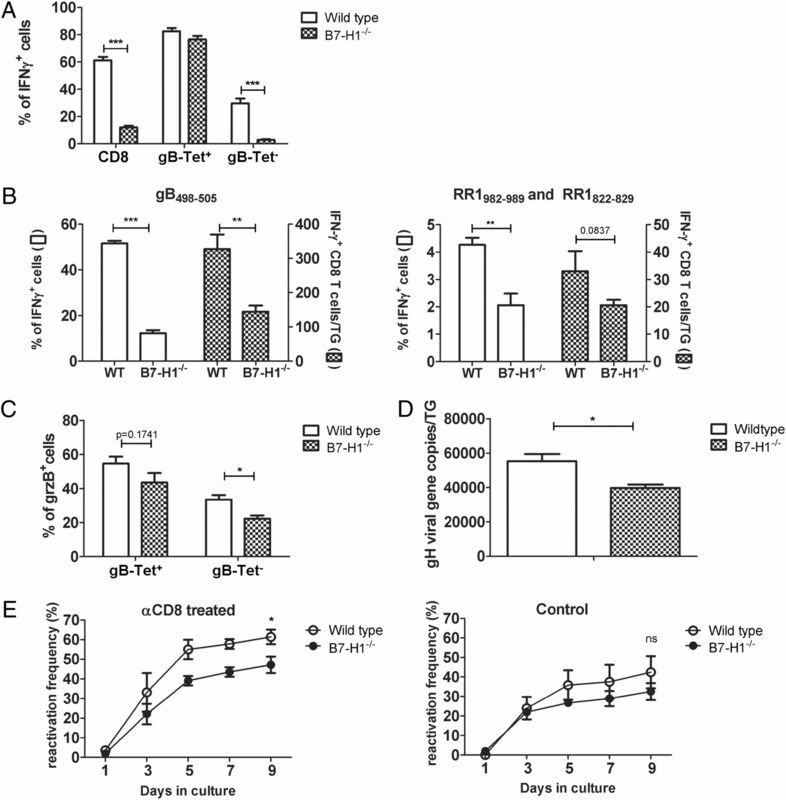 The absolute number of IFN-γ–producing subdominant RR1(982–989)– and RR1(822–829)–specific CD8+ T cells was equivalent in the TG of WT and B7-H1−/− mice (Fig. 8B, right), suggesting that the cells that survive as a result of disrupting the PD-1/B7-H1 interaction are largely nonfunctional. This is further supported by the observation that the percentage of grzB+ gB-Tet− CD8 is significantly decreased in B7-H1−/− mice (Fig. 8C), as well as that of IFN-γ+ gB-Tet− CD8 (Fig. 8A). Expanded gB-Tet− CD8+ T cells in B7-H1−/− mice are not functional. Dispersed TG cells from WT and B7-H1−/− mice (30 dpi) were (A) prestained with gB(498–505) tetramers (gB-Tet) before stimulation and then stained for CD45, CD8, and intracellular IFN-γ after 6 h of stimulation. Bars represent the mean ± SEM percentage of IFN-γ+ CD8+ T cells/TG (n = 10 mice); or (B) stimulated for 6 h with B6WT3 cells pulsed with gB(498–505) peptide (B, left panel) or pooled RR1(982–989) and RR1(822–829) peptides (B, right) followed by staining for CD45, CD8, and intracellular IFN-γ; or (C) stained directly for CD45, CD8, gB-Tet, and intracellular GrzB. Bars represent the mean ± SEM percentage of GrzB+ cells in gB-Tet+ or gB-Tet− CD8 populations (n = 5 mice). (D) DNA was extracted from TG of WT and B7-H1−/− mice (30 dpi), and HSV-1 genome copy number was determined by quantitative PCR. Bars represent the mean ± SEM genome copy number/TG (n = 5 mice). (E) TG of WT and B7-H1−/− mice (30 dpi) were dispersed and cultured with (left panel) or without (right panel) anti-CD8 mAb. Culture supernatants were serially sampled and assayed for infectious virus on monolayers of Vero cells to detect HSV-1 reactivation from latency. Symbols represent the mean ± SEM frequency of reactivation at each time point (n = 15 mice). Data for (A), (B), and (D) are pooled from at least two independent experiments; data for (C) are representative of two independent experiments. *p ≤ 0.05, **p ≤ 0.01, ***p ≤ 0.001. In WT C57BL/6 mice, HSV-1 reactivation from latency in ex vivo TG cultures correlates directly with viral genome copy number and inversely with the number of immunodominant CD8+ T cells in the TG at the time of excision cultures (24, 28). The B7-H1−/− TG showed a slight, but significant reduction in HSV-1 genome copy number during acute (8 dpi; data not shown) and latent infection (30 dpi; Fig. 8D). The B7-H1−/− TG also showed a slight, but significant reduction in reactivation frequency compared with WT TG in cultures in which CD8+ T cell function was compromised (Fig. 8E, left). The B7-H1−/− TG contained significantly more CD8+ T cells at the time of excision (Fig. 5A), but the increase represented nonfunctional gB-Tet− CD8+ T cells. Therefore, we predicted that the increased number would not result in increased protection from reactivation in TG cultures in which CD8+ T cell function was intact. Indeed, CD8+ T cells reduced the reactivation by an identical amount (31% reduction compared with cultures with anti-CD8 mAb) in WT and B7-H1−/− TG (Fig. 8E, right). The capacity of immunodominant gB498–505–specific CD8+ T cells to prevent HSV-1 reactivation from latency is well established (15, 25). These cells have been the primary focus of such studies because of their high frequency and known HSV specificity. However, it now appears that essentially all of the CD8+ T cells in the infected TG are HSV specific, whereas only half recognize the gB498–505 epitope (23, 26). Our recent study demonstrated that the subdominant CD8+ T cells in latently infected TG exhibit partial functional exhaustion associated with IL-10–mediated inhibition of their rate of cell division, functionality, and ability to inhibit HSV-1 reactivation from latency (A.J. St. Leger et al., submitted for publication). Protracted expression of the inhibitory PD-1 receptor has been associated with CD8+ T cell functional exhaustion in several tumor models and models of chronic viral infection (4, 5, 7, 8, 29–32). Approximately 10–20% of both immunodominant and subdominant HSV-specific effector CD8+ T cells that infiltrate the TG during acute infection (8 dpi) express high levels of PD-1 (data not shown). During latency, the frequency and level of expression of PD-1 is maintained on gB-Tet− TG-resident CD8+ T cells but declines among the immunodominant CD8+ T cells. The reason for the differential loss of PD-1 on immunodominant memory CD8+ T cells is not clear, but two possible explanations arise from our previous studies. We demonstrated that depletion of CD4+ T cells during the priming of the HSV-specific CD8+ T cell response resulted in a higher frequency of PD-1+ immunodominant gB-Tet+ CD8 in acutely infected TG (8 dpi) that persisted in the memory population up to 56 dpi (22). The increased PD-1 expression on the gB-Tet+ CD8 was associated with reduced functionality. Thus, differential PD-1 expression and functional exhaustion by gB-Tet− HSV-specific memory CD8+ T cells might reflect reduced CD4+ T cell help during priming, although to our knowledge, a mechanism that would permit selective CD4+ T cell help for immunodominant CD8+ T cells has not been described. An alternative explanation for the elevated PD-1 expression on TG-resident gB-Tet− memory CD8+ T cells might be that the epitopes recognized by these cells are expressed at a higher level in latently infected neurons. This would be consistent with the observation that these cells exhibit a higher level of proliferation than the immunodominant cells. Overexposure to subdominant epitopes could lead to exhaustion characterized by upregulation of PD-1 and ultimately physical deletion. CD8+ T cells in latently infected TG interact closely with neurons, the only cells that retain latent virus (15, 16). Because PD-1 inhibition of TCR signaling reportedly requires expression of the TCR ligand and PD-1 ligand on the same cell (33), we examined PD-L1/B7-H1 expression on neurons in infected TG. The frequency of PD-L1/B7-H1+ neurons increased dramatically during acute infection and remained higher than noninfected TG during latency. Because the number of PD-L1/B7-H1+ neurons exceeded the likely number of infected neurons in acutely infected TG, and their number declined in parallel with the declining numbers of TG-resident CD8+ T cells, we hypothesized that neuronal expression of PD-L1/B7-H1 might be regulated by a soluble mediator produced by CD8+ T cells. 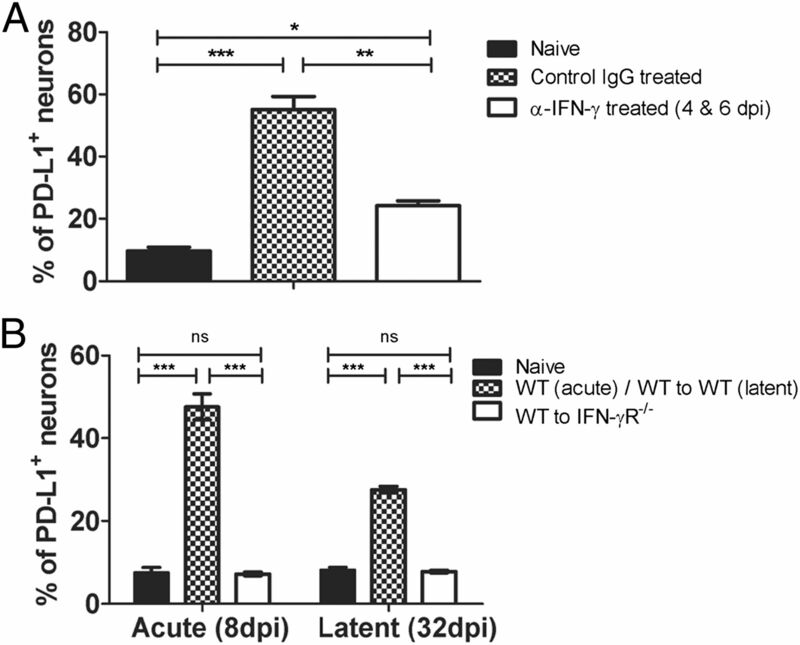 IFN-γ is persistently present in HSV-1 acutely and latently infected TG (34–38), and was shown to regulate PD-L1 expression on neurons in the brains of coronavirus-infected mice (27). Indeed, we found IFN-γ has a requisite role in regulating PD-L1 expression on neurons in infected TG. The ratio of viral genomes to neurons was 3-fold higher among PD-L1+ neurons compared with PD-L1− neurons, consistent with the notion that neurons with a higher load of latent virus are more likely to stimulate an IFN-γ response (presumably by CD8+ T cells). However, even the PD-L1+ neurons contained only 30 genome copies per 100 cells, suggesting that a maximum of 30% of PD-L1+ neurons harbor latent virus. Presumably, the ≥70% of PD-L1+ neurons that did not harbor latent virus were exposed to IFN-γ that diffused away from an encounter between a latently infected neuron and a CD8+ T cell or other IFN-γ–producing cell as previously described (39). Although PD-L1− neurons contain 3-fold fewer viral genomes than PD-L1+ neurons, there are ∼3-fold more PD-L1− neurons. Therefore, approximately half of latent HSV-1 genomes are harbored in neurons that have not been recently exposed to IFN-γ. This finding is consistent with the notion that a significant proportion of latent viral genomes are maintained in a latent state without immune intervention. The process of exhaustion appears to advance through stages marked by progressively reduced capacity for lytic granule-mediated target cell lysis, reduced production of cytokines, and ultimately, physical deletion of the exhausted cells (7). Cells at advanced stages of exhaustion are marked by increased levels of PD-1 expression (30). Our recent study demonstrated that immunodominant gB-Tet+ CD8 remain fully functional as assessed by cytokine production and lytic granule release when stimulated with gB498–505 peptide–pulsed targets directly ex vivo, whereas a significant proportion of subdominant CD8+ T cells lose functionality (A.J. St. Leger et al., submitted for publication). We further demonstrated that in vivo blockade of the IL-10R had little effect on the immunodominant gB-Tet+ CD8, but significantly increased the proliferation and size of the gB-Tet− CD8+ T cell pool, as well as the number of gB-Tet− CD8+ T cells capable of producing cytokines and expressing GrzB in latently infected TG. In this article, we show a higher frequency and higher level of expression of PD-1 in gB-Tet− relative to immunodominant CD8+ T cells in latently infected TG. Interfering with the PD-1/PD-L1 interaction resembles blockade of the IL-10R in selectively increasing the size of the gB-Tet− CD8+ T cell pool in latently infected TG. However, PD-1/PD-L1 blockade differs from IL-10R blockade in that it increases the size of the gB-Tet− CD8+ T cell pool by increasing survival rather than increasing proliferation. Moreover, the cells that survive as a result of PD-1/PD-L1 blockade express high levels of PD-1 and are not functional, resulting in a dramatic decrease in the frequency of functional gB-Tet− CD8+ T cells in latently infected TG. Several observations suggest that gB-Tet− CD8+ T cells in HSV-1 latently infected TG are selectively undergoing functional exhaustion and physical deletion. First, the gB-Tet− CD8+ T cells express less GrzB than the immunodominant cells, and GrzB expression is inversely related to PD-1 expression. Second, the ability to produce IFN-γ is maintained by virtually all immunodominant, but only a small portion of gB-Tet− CD8+ T cells in latently infected TG. Third, although the TG-resident gB-Tet− CD8+ T cells proliferate at a higher rate than the immunodominant cells, the two populations maintain a strict 1:1 ratio through an increased rate of apoptosis in the gB-Tet− population. Finally, disrupting the PD-1/PD-L1 interaction results in a dramatic accumulation of TG-resident gB-Tet− CD8+ T cells accompanied by a decrease in their rate of apoptosis. The surviving cells show a high frequency and level of expression of PD-1, a phenotype that is suggestive of cells in the late stages of exhaustion that would normally be deleted. Moreover, disrupting the PD-1/PD-L1 interaction does not result in an increased frequency or absolute number of functional CD8+ T cells as assessed by IFN-γ production or GrzB expression directly ex vivo. Similar results have been shown in HCV-infected patients who received PD-1/PD-L1 blockade (40). Thus, the PD-1/PD-L1 interaction alone is sufficient to reduce the survival of gB-Tet− HSV-specific CD8+ T cells, whereas their function may be regulated by the redundant activity of multiple inhibitory receptors. Based on these findings, we propose that the gB-Tet− TG-resident CD8+ T cells are constantly progressing through stages of exhaustion ranging from functional compromise to physical deletion, with IL-10R regulating the former and PD-1 regulating the latter. TG-resident CD8+ T cells can inhibit HSV-1 reactivation from latency in ex vivo TG cultures through release of IFN-γ and lytic granules containing GrzB (24, 25). Because immunodominant gB-Tet+ CD8 selectively retain these functions during latency, it is likely that gB-Tet+ CD8 play a primary role in preventing HSV-1 reactivation. Disruption of the PD-1/PD-L1 interaction in latently infected TG of B7-H1−/− mice had little effect on the immunodominant gB-Tet+ CD8 T cell, and resulted only in an increase in nonfunctional gB-Tet− CD8 T cells. Thus, we observed an identical level of CD8+ T cell protection from reactivation in ex vivo cultures of TG from WT and B7-H1−/− mice. Although a portion of CD8+ T cells in human TG express PD-1 (41), our findings suggest that blocking PD-1 function alone would probably not have therapeutic efficacy. However, combined blockade of PD-1, IL-10R, and perhaps other inhibitory receptors seems to have exciting potential for preventing HSV-1 reactivation from latency and recurrent herpetic disease. We thank Nancy Zurowski for flow cytometry acquisition and the National Institute of Allergy and Infectious Diseases Tetramer Core Facility (Emory University Vaccine Center, Atlanta, GA) for supplying tetramers. This work was supported by National Eye Institute Grants P30-EY08098 (to R.L.H. ), R01-EY005945 (to R.L.H. ), and T32-EY017271 (to A.J.S.L. ), and National Institutes of Health Grant R56AI85110 (to T.L.C. ), an unrestricted grant from Research to Prevent Blindness (New York, NY), and the Eye and Ear Foundation of Pittsburgh.
. 2009. High antigen levels are the cause of T cell exhaustion during chronic viral infection. Proc. Natl. Acad. Sci. USA 106: 8623–8628.
. 2006. PD-1 expression in acute hepatitis C virus (HCV) infection is associated with HCV-specific CD8 exhaustion. J. Virol. 80: 11398–11403.
. 1996. Developmentally regulated expression of the PD-1 protein on the surface of double-negative (CD4-CD8-) thymocytes. Int. Immunol. 8: 773–780.
. 1996. Expression of the PD-1 antigen on the surface of stimulated mouse T and B lymphocytes. Int. Immunol. 8: 765–772.
. 2010. Epigenetic regulation of latent HSV-1 gene expression. Biochim. Biophys. Acta 1799: 246–256.
. 2008. Chromatin control of herpes simplex virus lytic and latent infection. Nat. Rev. Microbiol. 6: 211–221.
. 2003. Herpes simplex virus-specific memory CD8+ T cells are selectively activated and retained in latently infected sensory ganglia. Immunity 18: 593–603.
. 2007. Selective retention of herpes simplex virus-specific T cells in latently infected human trigeminal ganglia. Proc. Natl. Acad. Sci. USA 104: 3496–3501.
. 2002. Spontaneous molecular reactivation of herpes simplex virus type 1 latency in mice. Proc. Natl. Acad. Sci. USA 99: 978–983.
. 1995. Quantification of transcripts from the ICP4 and thymidine kinase genes in mouse ganglia latently infected with herpes simplex virus. J. Virol. 69: 1389–1399.
. 2000. CD8(+) T cells can block herpes simplex virus type 1 (HSV-1) reactivation from latency in sensory neurons. J. Exp. Med. 191: 1459–1466.
. 2011. The role of LAT in increased CD8+ T cell exhaustion in trigeminal ganglia of mice latently infected with herpes simplex virus 1. J. Virol. 85: 4184–4197.
. 2012. Maintenance of T cell function in the face of chronic antigen stimulation and repeated reactivation for a latent virus infection. J. Immunol. 188: 2173–2178.
. 2010. Early CD4(+) T cell help prevents partial CD8(+) T cell exhaustion and promotes maintenance of Herpes Simplex Virus 1 latency. J. Immunol. 184: 277–286.
. 2011. Defining the herpes simplex virus-specific CD8+ T cell repertoire in C57BL/6 mice. J. Immunol. 186: 3927–3933.
. 2008. Noncytotoxic lytic granule-mediated CD8+ T cell inhibition of HSV-1 reactivation from neuronal latency. Science 322: 268–271.
. 2001. Gamma interferon can prevent herpes simplex virus type 1 reactivation from latency in sensory neurons. J. Virol. 75: 11178–11184.
. 2009. Reevaluating the CD8 T-cell response to herpes simplex virus type 1: involvement of CD8 T cells reactive to subdominant epitopes. J. Virol. 83: 2237–2245.
. 2009. Target-dependent B7-H1 regulation contributes to clearance of central nervous system infection and dampens morbidity. J. Immunol. 182: 5430–5438.
. 2007. Rates of reactivation of latent herpes simplex virus from mouse trigeminal ganglia ex vivo correlate directly with viral load and inversely with number of infiltrating CD8+ T cells. J. Virol. 81: 8157–8164. Thompson, R. H., H. Dong, C. M. Lohse, B. C. Leibovich, M. L. Blute, J. C. Cheville, and E. D. Kwon. 2007. 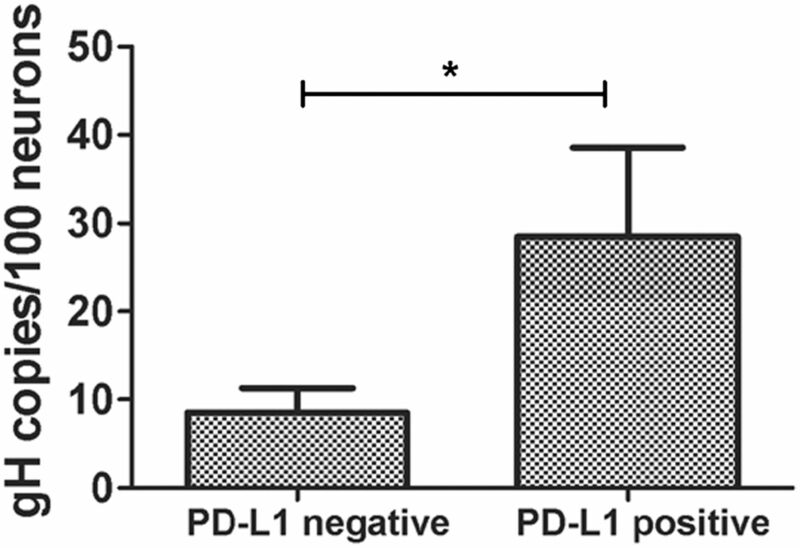 PD-1 is expressed by tumor-infiltrating immune cells and is associated with poor outcome for patients with renal cell carcinoma. Clin. Cancer Res 13: 1757–1761.
. 2003. Program death-1 engagement upon TCR activation has distinct effects on costimulation and cytokine-driven proliferation: attenuation of ICOS, IL-4, and IL-21, but not CD28, IL-7, and IL-15 responses. J. Immunol. 170: 711–718.
. 1999. Role for gamma interferon in control of herpes simplex virus type 1 reactivation. J. Virol. 73: 3418–3423.
. 1995. Gamma interferon expression during acute and latent nervous system infection by herpes simplex virus type 1. J. Virol. 69: 4898–4905.
. 2000. Persistent elevated expression of cytokine transcripts in ganglia latently infected with herpes simplex virus in the absence of ganglionic replication or reactivation. Virology 278: 207–216.
. 1996. Persistent cytokine expression in trigeminal ganglion latently infected with herpes simplex virus type 1. J. Immunol. 157: 3542–3549.
. 1997. Cytokine production in the nervous system of mice during acute and latent infection with herpes simplex virus type 1. J. Gen. Virol. 78: 3317–3325.
. 2012. Cytotoxic immunological synapses do not restrict the action of interferon-γ to antigenic target cells. Proc. Natl. Acad. Sci. USA 109: 7835–7840. Nakamoto, N., D. E. Kaplan, J. Coleclough, Y. Li, M. E. Valiga, M. Kaminski, A. Shaked, K. Olthoff, E. Gostick, D. A. Price, et al. 2008. Functional restoration of HCV-specific CD8 T cells by PD-1 blockade is defined by PD-1 expression and compartmentalization. Gastroenterology 134: 1927–1937, 1937.e1–e2.
. 2009. Neuron-interacting satellite glial cells in human trigeminal ganglia have an APC phenotype. J. Immunol. 183: 2456–2461.